Organic ice cream is the ultimate luxury dish and the best is always local, always sustainable. Since today is my birthday and I'll be in New England enjoying the fruits of the season, here are some of my favorite ice cream stands, ranging from simply amazing local to supremely sustainable. If you aren't traveling up this way during ice cream season (and let's face it, for a New Englander, any season is ice cream season: we consume the most ice cream out of any region in the US! ), here's Bon Apetit's list of the Top Ten Sustainable Ice Cream Shops in the USA. From Scottsdale Arizona to Atlanta and on to Philadelphia, I hope one is within driving range for you. Technically I'm not even in New England yet when I start my ice cream tour, but when summer comes and I'm driving northeast, I make a slight detour to Princeton, New Jersey to the Bent Spoon, an artisanal bakery and ice cream shop. School Garden Chocolate Mint and plain old Peach are two of the best flavors (based on their project of getting gardens into local public schools!). Did you know that Dolly Madison's favorite ice cream flavor was oyster? I kid you not. I'm not in a great rush to find any, but this year I think I'm too late to get a taste of "Hadley Grass," Asparagus (and almond) Ice Cream at Flayvors of Hadley, Massachusetts. The Pioneer Valley, a well preserved mix between college towns and farms, boasts some of the best loam in the country and is known for its farms full of tobacco leaves and asparagus, the latter of which is featured in season at Flayvors, a fifth generation dairy farm owned by the Cook family. While you're eating your cone, you can go right behind the shop and thank the cows. 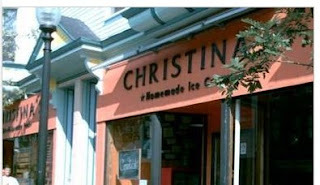 After we're settled in, I take a quick jaunt into the Cambridge-Boston area and I'm at Christina's which is also a nationally known artisanal shop that makes almost every flavor imaginable. Cinnamon Rice Pudding captures my imagination and my palate. In college, I was a JP Licks fan, but the list at Christina's is so long, it's going to take a while before I'm ready to move on. A weekend visit to my parents in New Hampshire is not complete without a trip to Hayward's Ice Cream stand. It's definitely local, probably not organic, but packed with personal nostalgia. Sometimes we can skip the trip down memory lane and hope over to the Walpole Creamery, which is sustainable, made from non-bovine growth hormone milk that's produced right next door. Sweet cream is the flavor of choice. Maybe it seems a bit out of the way, since you can get the stuff in your local supermarket now that Ben and Jerry's is a global brand, but there's nothing like a short trip up to Burlington, Vermont to get the real thing scooped out close to the source. Since 1978 the makers of Cherry Garcia and Super Fudge Chunk have been deeply involved in sustainable environmental efforts. Definitely worth eating. 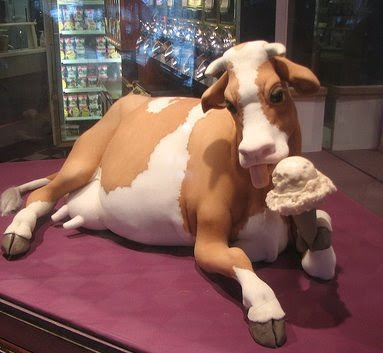 I know I'm finally home when I walk into Bart's Homemade in downtown Amherst, Massachusetts and see the soft sculpture cow licking a cone and order a simple scoop of malted vanilla. Sometimes you know the best is last and just around the corner: Herrell's in Northampton is the last remaining store run by the venerable Steve Herrell of Steve's Ice Cream fame (yes, in the 1980s, I waited on line in Harvard Square for hours for a Heath bar mix-in. Wouldn't you?). Both Herrell's and Bart's rely on local milk and engage in fair labor, sustainable practices. Later in the summer, I'll be heading to Maine for some beach time and I hope this year I'll get to stop in Beal's Ice Cream of Portland. It will be well past the blueberry season by then, but maybe the raspberry will prove equally satisfying. Don't let summer pass you by without celebrating the sweet creamy sustainable goodness that is ice cream. photo image of Flayvors Ice cream by Bill Owens of New England Photos Blog.